Breast is best but for mums who need an infant formula feed, soya-based formulas are a safe and nutritious alternative to cow’s milk-based ones. This fact sheet is only available online. Breast is best for babies and all mothers should be encouraged to breastfeed. Breastmilk is the most perfectly designed food in the world and gives babies the very best start in life. Not only does it provide all the nutritional needs for very young infants, it also helps establish emotional bonds. The World Health Organisation recommends that most women should exclusively breastfeed their babies for the first six months of life. However, for various good reasons, bottle feeding may in some cases prove to be necessary. For vegetarian and vegan mothers soya-based infant formulas are suitable substitutes where breastfeeding is not possible. Currently there are no completely animal-free soya-based infant formula suitable for mothers who wish to bring their baby up on a vegan diet. Vegetarian soya-based infant formulas (the only animal derived ingredient being vitamin D3) are InfaSoy from Cow & Gate and Wysoy from SMA Nutrition. Soya-based infant formulas are nutritionally complete and comply with strict UK and EC legislation which specifies the nutritional composition of these formula feeds. Babies must NEVER be given normal adult cow's milk or normal adult soya milk until after the age of a year as these do not provide all the nutrients a baby needs. Millions of infants worldwide have safely been fed soya-based infant formulas over the last 60 years (1). Discussions in the media surrounding the hormonal effects of soya and soya-based infant formulas have however caused unnecessary concern to some parents. Two areas that have been highlighted are the role that soya may play in sexual development (2) and immune function (3) – the system that helps the body fight off infection. The debate has centered around the actions of compounds in soya beans called isoflavones or phytoestrogens. These compounds behave like oestrogen, the female hormone, but are in fact very weak – between 1,000 and 10,000 times weaker than oestrogen. Far from upsetting oestrogen levels in the body isoflavones seem to normalise them and there have been numerous papers detailing the health-promoting effects of soya bean consumption. Indeed Cancer Research UK has highlighted a very important study showing that women who eat a lot of soya are 60% less likely to have the ‘dense’ tissue associated with breast cancer than those who ate the least (4). Much of the work that has thrown up concerns about soya involves the use of animals and isolation of particular components of the soya bean itself – eg the phytoestrogens it contains. There are two major arguments as to why such research may have limited application to humans. Firstly, using animals as models for humans is very unreliable – results that show up in animals may not translate to humans. Secondly, eating soya or feeding it as a formula feed to babies is not the same as isolating and injecting the chemicals it contains. The body often deactivates the chemicals that are eaten or converts them to another form (5). This means that injecting a chemical into an animal is likely to have a more potent effect than on a baby who consumes soya-based infant formula (6). Against the background of a small number of animal-based studies there is a large amount of scientific literature attesting to the fact that soya-based infant formulas are safe feeding options. A literature review in 1998 of all the major studies on soya-based infant formulas found no evidence of hormonal effects in adults who had consumed these soya formulas in infancy. The authors concluded that soya-based infant formulas continue to be a safe feeding option for infants (1). Similarly a review in 2002 reported that recent data suggest that there are no long-term adverse effects of early exposure to soya formula through young adulthood (7). An important study in 2001 looked at measures of sexual development in adults who, as infants, had been fed soya-based infant formulas. For more than 30 outcomes measured – eg height, weight, effects on puberty or fertility – no evidence of problems with general health or sexual development in the subjects was found (8). The Food Standards Agency (FSA) is in the process of looking at all the major issues surrounding dietary phytoestrogens, including soya infant formula. At the present time the FSA line on this issue still stands – that where parents have been advised by their doctor or health professional to feed their baby soya-based infant formula, they should continue to do so (9). The Government’s Committee on Toxicity of Chemicals in Food, Consumer Products and the Environment (COT) published a report in May 2003 on Phytoestrogens and Health. The purpose of this report was to consider and advise on the health implications of exposure to phytoestrogens in the diet through the review of published scientific research and the FSA’s Phytoestrogen research programme. Page 10 of this report states that: “The Working Group considered that the findings from these studies do not provide definitive evidence that phytoestrogens present in soya-based infant formula can adversely affect the health of infants” (10). Of course soya is not a natural food for babies but then again nor is cow’s milk. Cow’s milk is meant for calves, not humans, and is itself loaded with oestrogens – and not the mild ones derived from plants but potent oestrogens from another mammal. Cow’s milk is also implicated in a whole range of health problems in children such as digestive upsets, ear infections, skin conditions, tends to interfere with iron absorption and has virtually no iron of its own. The world’s leading expert on baby and child care - Dr Benjamin Spock (1904-1998) – advocated a plant-based diet for everyone including infants and children. He states in his child care book (a book that has sold over 50 million copies worldwide) that “non-dairy milk, particularly soya milk, has real advantages over cow's milk and other dairy products” (14). Aluminium is the earth’s most abundant metal and is naturally found in drinking water and all animal and plant foods. Although levels are higher in soya-based infant formulas than in breastmilk, the levels are considered safe and any risk therefore remains theoretical (11). Ensuring infants grow up with healthy teeth and gums is, of course, vitally important. 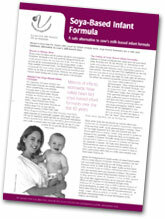 All infant formulas must comply with standards laid down by UK Regulations which specify minimum and maximum amounts of carbohydrate (energy). Most formulas use lactose – the sugar in cow’s milk – as the source of this carbohydrate. For parents who do not wish to use a product containing lactose a suitable alternative carbohydrate must therefore be used. Glucose syrup is the carbohydrate used in soya-based infant formulas. Glucose syrup is often confused with sugars but in fact comes from corn starch and is not the same as glucose or syrup. It is mainly made up of beneficial complex (starchy) carbohydrates not simple carbohydrates (sugars) which are known to be harmful to teeth. Tooth decay can be the result of many factors, not only the presence of sugars in a food or drink. Research has shown that soya-based infant formulas are no more likely to cause tooth decay than cow’s-based infant formulas (12). The most important factor appears to be how they are consumed. Any food or drink containing sugars should not have frequent or prolonged contact with teeth and trainer cups should be used as soon as a baby is able to drink this way. Thus if normal weaning practices are adopted, soya-based infant formulas should not cause harm to teeth (13). Babies should NEVER be given normal adult cow’s milk or normal adult soya milk. Numerous studies demonstrate the safety and health benefits of soya. Aluminium in soya-based infant formula is not a cause for concern. Normal weaning practices ensure that soya-based infant formulas will not harm teeth. Studies looking at humans suggest that the use of soya-based infant formula continues to be a safe feeding option for infants. Klein KO, 1998. Isoflavones, soya-based infant formulas and relevance to endocrine function. Nutrition Reviews;56(7):193-204. Sharpe RM et al, 2002. Infant feeding with soy formula milk: effects on the testis and on blood testosterone levels in marmoset monkeys during the period of neonatal testicular activity. Human Reproduction;17(7):1692-1703. Yellayi S et al, 2002. The phytoestrogen genistein induces thymic and immune changes: a human health concern? PNAS USA;99(11):7616-7621. Jakes RW et al, 2002. Mammographic Parenchymal Patterns and Self-Reported Soya Intake in Singapore Chinese Women. Cancer Epid. Biomarkers and Prevention; 11(7):608-613. Randerson J, (Quoting soya expert Stephen Barnes.) 25.05.02. Baby Milk Blues. New Scientist: 9. Editorial, FSA: Soya Baby Milk is Safe. June 2002. Natural Products Magazine. Badger TM et al, 2002. The health consequences of early soy consumption. J. Nutr.;132:559S-565S. Strom BL et al, 2001. Exposure to soya-based formula in infancy and endocrinological and reproductive outcomes in young adulthood. JAMA;286 (7): 807-814. FSA Position on Soya-Based Infant Formula – E-mail communication with Jeffery B, Senior Scientist, FSA.13th August 2002. Committee on Toxicity of Chemicals in Food, Consumer Products and the Environment (COT) – Phytoestrogens and Health. p.10. Crown Copyright May 2003. BNF Briefing Paper on Vegetarianism 1995. Moynihan PJ et al, 1996. A comparison of the relative acidogenic potential of infant milk and soya infant formula: a plaque pH study. Intl J. of Paediatric Dentistry; 6:177-181. Hood S, July 2000. Vegan nutrition for infants, children and adolescents. The Nutrition Practitioner;2.2:60-61. Spock B. 1999. Dr Spock's Baby and Child Care. p.173 & 177. (Simon & Schuster).